In case you missed it this this morning, Capitol Broadcasting Company published an editorial over at WRAL that takes aim at state legislative leaders following the news that State Board of Education Chairman Bill Cobey is stepping down from the board next month. Cobey, a longtime North Carolina Republican who once chaired the statewide GOP and served in Congress, has often been at odds with the Republican-controlled legislature in recent years. The editorial notes the reaction from Republican lawmakers, or rather lack of reaction, to Cobey’s departure is telling. Last week Chairman Bill Cobey, announced his resignation from the State Board of Education six months before the end of his term. “I want to move on so that others can lead,” he said. We hope he’d serve his entire term, but we are not surprised that he is leaving. Who could blame Cobey, at 79, for taking a break from the daily attacks on our public education system by Senate Leader Phil Berger and House Speaker Tim Moore. 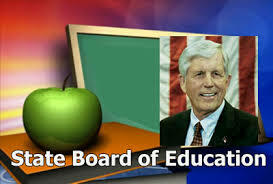 They have been unrelenting in their efforts to dismantle the State Board of Education. Cobey fought the good fight on behalf of the board and is still fighting. There are few North Carolinians who can claim Cobey’s conservative Republican pedigree. In 1982 (when Speaker Moore was 12 years old) he was Jesse Helms’ Congressional Club choice to unseat a four-term Democrat in the Fourth Congressional District. He fell short that year, but won the seat two years later. Cobey was Secretary of Environment and Natural Resources under Gov. Jim Martin. He served as chairman of the state Republican Party. He was on the board of a private school and vice chairman of the Jesse Helms Center in 2013 when Gov. Pat McCrory named him to the State Board and he was elected its chairman. It is certainly curious that, upon his resignation, Cobey received public words of appreciation for his service from Gov. Roy Cooper and former Democratic Superintendent of Public Instruction June Atkinson while Republicans, including Berger, Moore and former Gov. McCrory who appointed him, were uncharacteristically muted. It is the fact that Cobey isn’t a pushover; that he stands up for his principles and also works with Democrats to find common ground to strengthen public education; that he stands up for the constitutional role of the State Board of Education in the face of legislative efforts to weaken it. That infuriates Berger and Moore. State Superintendent of Public Instruction Mark Johnson has been acquiescent to the legislative leadership and with newly-enacted powers from the legislature, worked to subvert the state board’s authority. The current leaders of the General Assembly see every exchange as an opportunity for a confrontation, every issue is reason for ideological combat. Anyone who might have the moxie to suggest an alternative solution or competing idea is the enemy. Cobey has been under attack for several years. He fought hard. Make no mistake about it, Bill Cobey believes in the strength of his ideas and positions. But he also has the confidence to let others challenge them and discuss them. Most significantly, he has the patience to listen and work with those with different perspectives to seek common solutions. That’s not being a push over or liberal. That’s leadership. It’s about putting the interests of the state, public schools and children first. Cobey has the right priorities. They are sorely lacking among many members of the General Assembly. We extend our admiration for, and thanks to, Bill Cobey and his service to North Carolina.